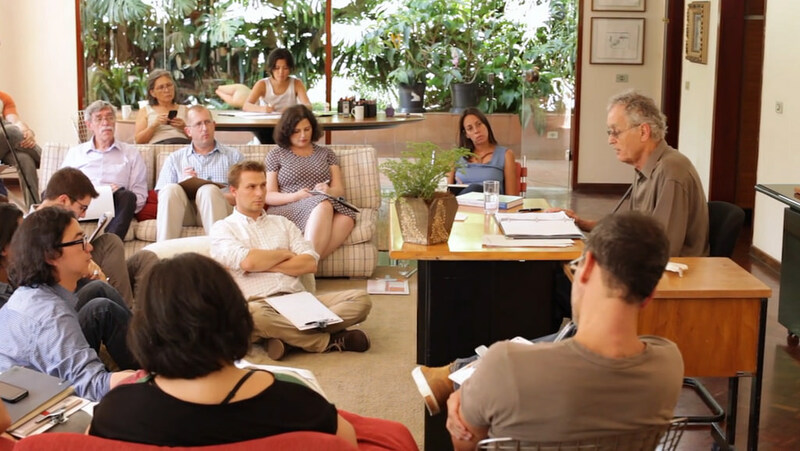 We are now one third of the way through the fall edition of Fritjof Capra’s Capra Course and we have come to the lecture on Mind and Consciousness. In this lecture Fritjof discusses “one of the most important and most radical philosophical implications of the new systemic understanding of life: a new conception of the nature of mind and consciousness, which finally overcomes the Cartesian division between mind and matter”. The decisive advance of the systems view of life has been to realize that mind and consciousness are not things but processes.This novel concept of mind was conceived by Gregory Bateson, and was developed into the so-called Santiago theory of cognition by Humberto Maturana and Francisco Varela. This week’s lecture has made me think a lot about the very essence of travelling. I’ve hitchhiked thousands of kilometers in the last weeks and when I look back at everything I perceived, felt and thought, everything I coupled to, I see a process: the process of cognition and the process of life. I see beauty in many corners of my journey. And I ask myself, and now to all of you: what is beauty. Where does it stand between primary and extended consciousness, between feeling and idea, between core and autobiographic self? How much of it belongs to a social consensus? In this conversation, Fritjof shared with everyone an interview he gave to Indian artist Shakti Maira in which he discussed beauty in relation to the systems view of life. The interview was featured in Maira’s book The Promise of Beauty and Why It Matters (Harper Collins India) which was published earlier this year. 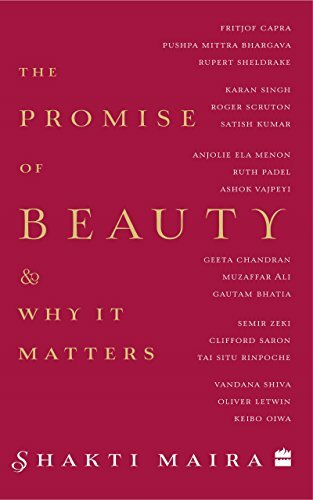 In his book Maira asks the question what would happen if beauty were to become central to every aspect of our lives: environment, education, economics and governance, and includes eighteen interviews from leading thinkers in a wide range of fields. Scientists explore whether there is an evolutionary purpose to it. Philosophers examine its relationship to truth and goodness. Artists speak of beauty and its rejection. Brain mind experts consider whether the experience of it strengthens certain neural pathways connected with the qualities of balance, harmony, rhythm and proportion. Activists probe how beauty works in the context of social systems. 1) In the research and thinking for your recent book on Leonardo da Vinci, did you come across, or form, any new or deep insights into ‘beauty’? Yes, I did. My explorations of Leonardo’s unique synthesis of science and art forced me to think more deeply about the nature of beauty, because this is a subject Leonardo addresses frequently. He was famous during his lifetime for the “air of sweetness and gentleness” manifest both in his personality and in his art, for the gentle beauty radiating from the faces of the young men and women he portrayed and of the angels in his religious paintings. Leonardo himself associated the experience of beauty in the mind of a viewer of these paintings with an experience of proportion and harmony, and he also compared that visual experience with the beauty of a musical composition. “The beautiful proportions of an angelic face in painting,” he wrote, “produce a harmonious concord, which reaches the eye simultaneously, just as a chord in music affects the ear” (Treatise on Painting, chapter 21). So, my studies of Leonardo’s art and science confirmed an intuition I had had before — of beauty as an experience of proportion and harmony, both is space and in time. 2) Your thoughts on the axioms of beauty in the classical traditions in the light of new thinking in the sciences? Do you see any opportunities of synthesis and integration? I do indeed see an opportunity for synthesis and integration, which is suggested by cognitive science — a new interdisciplinary field for the study of mind and consciousness. According to modern cognitive science, our minds (or processes of cognition) are embodied in the structures of our bodies and brains, and hence all the structures and patterns we perceive are conditioned by those in our bodies and brains. It seems to me that the experience of beauty may arise when the proportions and rhythms we perceive mirror our own bodily (and especially neural) proportions and rhythms very closely. In those cases, we perceive those proportions as harmonious and beautiful because, in a sense, we recognize ourselves in them. Beauty may perhaps be the experience of a certain resonance phenomenon. So far, this is just a vague intuition, but I think it might be worthwhile to explore it further. 3) Though your work is now more in the life sciences, your early training was in physics, and you famously brought together Nataraja, the iconic dancing Shiva, and particle physics. Could you tell us about your experience of ‘beauty’ in physics? My experience of the metaphorical identity of the Dance of Shiva and the dance of subatomic particles, which happened in the late 1960s and which I described in detail in the Preface of The Tao of Physics, was not primarily an experience of beauty, although it had aesthetic elements. It was primarily the experience of a unifying idea that was profoundly meaningful. In my work as a physicist, my experiences of beauty were mainly those of mathematical elegance. Certain mathematical formalisms or equations represent elegant unifications of previously “messy” fragments. The sudden experience of such an elegant unification can be a profound experience of beauty. 4) Could you say something about the relational values or relational qualities of harmony, balance, proportionality and rhythm, in nature? Do you think beauty is part of the self-regulating process of natural systems? Could beauty (harmony, balance, et al) in nature be an adaptive and network management mechanism? Over the last 25 years, a new understanding of life has been emerging at the forefront of science. The universe is not longer seen as a machine composed of elementary building blocks. We have discovered that the material world, ultimately, is a network of inseparable patterns of relationships; that the planet as a whole is a living, self-regulating system. Essential to this new science is a new kind of systemic, or ecological thinking — thinking in terms of relationships, patterns, context. Because of the close connection of beauty with the relational qualities of harmony, balance, and proportions, the emerging science of qualities now opens up the exciting possibility of seriously integrating aesthetic dimensions into science. 5) In your ecological educational work, do you bring in the dimension of beauty? And if so, how? At the Center for Ecoliteracy, my colleagues and I have developed a special pedagogy for primary and secondary education, which we call “schooling for sustainability.” It is a systemic, experiential, and community-oriented approach to teaching the basic principles of ecology. We take children out into nature and involve them in growing food in school gardens, restoring rivers and creeks, and other ecological projects. Our aim is not to merely to produce first-rate ecologists, but to help students make an emotional connection with nature, generating feelings of love, respect, and reciprocity that will turn them into environmentally responsible citizens and stewards of the natural environment when they become adults. We have found that the arts — poetry, the visual arts, and the performing arts — are an ideal means to facilitate such an emotional connection with nature. Hence the arts, and with them the dimension of beauty, play an important role in our pedagogy.